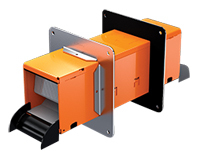 Designed for new or existing cable installations through up to 9″ (22.9 cm) thick walls, or floors the Series 33 pathway holds up to 120 CAT 5E cables. Designed for new or existing cable installations through up to 10″ (25 cm) thick walls, or floors, the EZ-Path Series 44+ pathway holds up to 240 CAT 5E cables. STI SSB14 Firestop Pillow: 1" x 4" x 9"
Firestop Pillows are designed for firestopping medium to large openings containing various penetrating items such as pipes, conduits, cables, insulated metal pipes, bus ducts and HVAC ducts. Pillows are particularly well suited for applications involving data, communications, power or control cables, innerducts and cable trays. 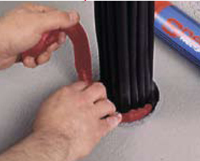 This method of sealing offers easy retrofitting of cable installations without the need to damage the firestop seal. Difficult applications such as one-sided shaft wall installations and other applications where access is restricted to one side of the assembly may be easily firestopped with this material. STI SSB24 Firestop Pillow: 2" x 4" x 9"
STI SSB26 Firestop Pillow: 2" x 6" x 9"
STI SSB36 Firestop Pillow: 3" x 6" x 9"
Looking for Ease of Installation, Versatility, and Easy Retrofit for Small Cable Penetrations? When firestopping cables that require retrofitting, SpecSeal® SSP Putty is the product of choice. SpecSeal® Series SSP Putty is a non-hardening, intumescent compound designed to seal through-penetrations as well as certain membrane penetrations against the spread of fire, smoke and toxic gasses. SpecSeal Putty expands up to 8 times its original size when exposed to high temperatures or flames. 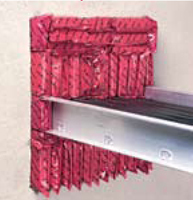 Requiring no tools, SpecSeal® Putty is soft and pliable making it easy to install by hand packing into openings. Its aggressive adhesion makes it suitable for use with all common construction materials as well as cable jacketing and pipes. SpecSeal Putty remains soft and easy to reuse or retrofit.